Importantly, with our service you only pay for the space you use. You dont have to pay for a full container or even a “half container” or a “half load”  we will only charge you based on the exact volume that you need. This is an important difference compared to sea container services, where you either have to pay for a whole 20 or 40 container (with space that you wont use), or you have to wait for months for the shipper to fill a container with “part loads”. In contrast, our trucks are constantly moving to and from Greece, and are segmentalised so that each customer only pays for exactly the volume that their goods occupy. We can even handle very small consignments of only a box or two (particularly cost-effective if you live in the destinations that we go to most)  please see our Parcel services. Nomad has very regular services to and from Greece, with our own vehicles in Greece every two to three weeks on average. We travel to all of the Greek islands, and we have a special focus on Crete. Naturally we conduct removals in the other direction (from Greece to other countries) as well, and we offer excellent rates for these removals. When planning your move, it is important to ask your removal company whether they will be taking your goods by road or by sea container, because there will be significant implications for the length of time it will take for your goods to arrive. Sea containers can take up to 16 weeks to arrive because they do not travel directly to their final destination, but stop at many ports along the way. Delays at ports are very common (Piraeus is notorious), making it impossible to know when they will arrive. Overland transport is much faster, typically arriving within 7 days of leaving the UK. Nomad International uses overland transport exclusively, ensuring your goods will arrive at your door in record time. Of course if you would prefer a delay between the time of your collection and your delivery, this is no problem either. 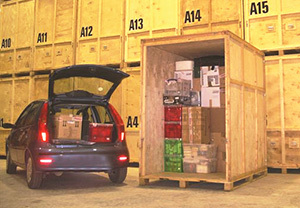 We have storage facilities both in the UK and Greece. It is critical that your goods are transported to your door, not just to the port. There are countless stories of British families having a container full of goods arrive at their nearest port, and being told that they have an hour to empty the container (themselves) before it will be taken away! Nomad International will always deliver your goods to your home (and into the appropriate rooms), using our own professional team. Please also note the difference compared to a kerbside service, which many general haulage companies and some cowboy operators use  these people collect and deliver to the kerbside only, requiring the customer to unload the vehicle and carry everything inside. Nomad never does this  we always conduct full, professional door-to-door removals. Most removal companies dont actually travel to Greece themselves  instead they sub the work out to other transport firms, including general hauliers, who may not use specialised vehicles for furniture transport. This is even true of reputable UK removal companies  they will usually not go to Greece themselves, and instead sub out the work to other contractors. This means you do not know who will be delivering your goods in Greece, or even if they will speak English. 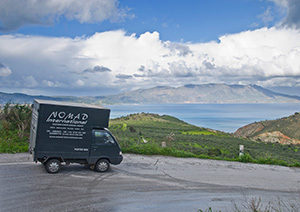 Nomad transports your goods from door-to-door with our own team and our own vehicles throughout the entire journey from the UK to Greece, staying with them the whole time. Our highly recommended team will be there for you on both sides. 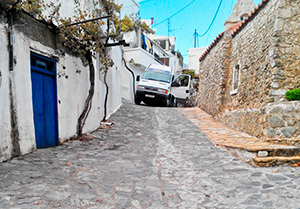 Many properties in Greece are difficult to access  steep ascents, narrow roads and tiny lanes are very common! Nomad International has years of experience in dealing with these challenges, and is well-equipped to access your property. In Greece we have our own shuttle vehicles in varying sizes just for this purpose, so you never have to worry that we wont be able to reach your property. This is a contrast to sea container services  many roads in Greece are simply not accessible by container trucks. 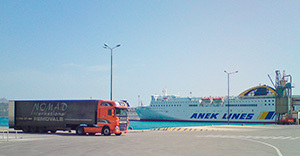 Even if the company has arranged for onward transport of a container (instead of leaving it at the port), most properties cannot be accessed with container trucks. Shuttle vans are essential in these cases, and we have our own on site. Nomad can ship goods of any volume to or from Greece, from a few boxes to entire country homes. 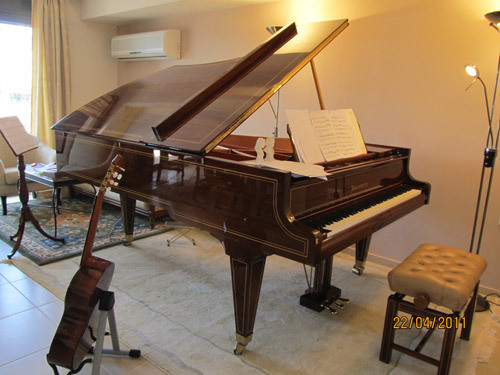 We also regularly transport cars, boats and motorbikes, as well as delicate antique items like this £25,000 piano (see Testimonial from Mr Kypri). The only way you can be sure that your removal company is operating professionally is if they are a member of the BAR. This means they are monitored regularly to ensure that they are financially viable, that they offer proper insurance, that their staff are properly trained and that they have all of the correct systems in place to do the job properly. 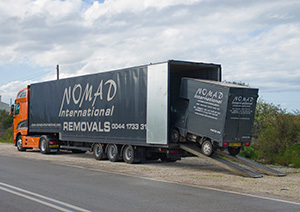 Nomad International is a proud member of the BAR  as such we are not just another man with a van or a general haulage company claiming to do removals, as is all too common in Greece. We always do the job properly from start to finish. With BAR contracts the customer is also protected financially should something go wrong. Find out more about the protection provided by using a BAR member company for your removal. If your removal company is not a BAR member you dont have this protection. Remember that if a vehicle or container transporting your goods will be leaving the EU en route, your goods will be required to clear customs on arrival, which involves a significant amount of paperwork which often has to be completed by you, in person at customs. This is the case with all sea container shipping  this onerous paperwork is always required for container shipping. 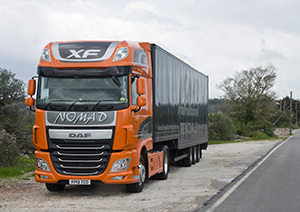 Nomads vehicles travel direct between the UK and Greece, never leaving the EU. We complete all of the transport and customs documentation for you. We have dedicated storage facilities in the UK and access to professional storage facilities in Greece. We can accommodate any quantity of goods for any length of time at our UK warehouse, while in Greece our storage facilities are very helpful for short-term storage as part of your removal. For more detail on why Nomad International is the perfect choice for removals to or from Greece, click here. Or don’t hesitate to get a quote for your removal today! Removals to Attica (removals to Athens, removals to East Attica, removals to Piraeus, removals to West Attica), removals to Euboea, removals to Evrytania, removals to Phocis, removals to Phthiotis, removals to Boeotia, removals to Chalkidiki, removals to Imathia, removals to Kilkis, removals to Pella, removals to Pieria, removals to Serres, removals to Thessaloniki, removals to Chania, removals to Heraklion, removals to Lasithi, removals to Rethymno, removals to Drama, removals to Evros, removals to Kavala, removals to Rhodope, removals to Xanthi, removals to Arta, removals to Ioannina, removals to Preveza, removals to Thesprotia, removals to Corfu, removals to Kefalonia and Ithaca, removals to Lefkada, removals to Zakynthos (Zante), removals to Chios, removals to Lesbos, removals to Samos, removals to Arcadia, removals to Argolis, removals to Corinthia, removals to Laconia, removals to Messinia, removals to Kalamata, removals to Stoupa, removals to Peloponnese, removals to Cyclades, removals to Dodecanese, removals to Karditsa, removals to Larissa, removals to Magnesia, removals to Trikala, removals to Achaea, removals to Aetolia-Acarnania, removals to Elis, removals to Florina, removals to Grevena, removals to Kastoria, removals to Kozani.